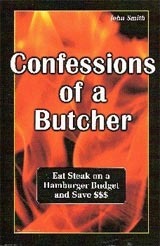 Confessions of a Butcher is a book that I wrote to ease my conscience. 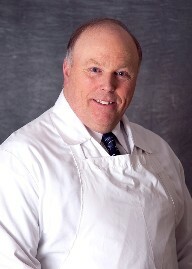 You see, I’m a butcher. In fact I’ve been a butcher for over 30 some years now, and over the years I have taken part, daily, in the retail meat industries universal scheme to get you, the unsuspecting consumer, to part with as much money as possible on your meat purchases. You see, there is no need to spend the kind of money that most of you spend for meat. Confessions of a Butcher is designed to empower you, the consumer. With my book in hand you will be able to circumvent the traps in the meat counters of your local supermarkets and still get just the right cut of beef or pork with just the right dimensions, juiciness and tenderness that you desire but for less money, sometimes a lot less. How can this be, you ask? Its quite simple. My butcher colleagues and I have been taking the few primals (large sections of beef) and cutting them into hundreds of shapes and sizes and selling them for more and more money for several generations now. This is called merchandising. What I do in my book is show you how to demerchandise and get the cut of beef or pork that you want in just the right size, dimensions and quality for less money. Confessions of a Butcher lists virtually every single cut of beef and pork and what I like to call their alternative cuts that will save you money. With my book in hand you will be the master of the meat department. No longer will you pay the asking price for the cuts of meat that you want. 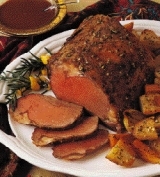 My book also contains many tips and helpful tidbits on Lamb, Veal and Poultry along with a few of my favorite recipes. Buy a copy today! Welcome to our new and improved site! Please be patient during this transition. Buy Confessions of a Butcher! Ark Essentials Copyright © 2010. All rights reserved.